Situated in the northwest suburb of Beijing and 10 kilometers from downtown, the Summer Palace is a famous classical imperial garden. More than 30 classical structures are scattered on the Longevity Hill and around the Kunming Lake. Natural scenery is skillfully combined with man-made scenes and sights to form a garden of breathtaking beauty. Long and short dykes have been built to divide the Kunming Lake in three parts, and three isles were constructed to symbolize the celestial hills in ancient mythology and give expression to the emperors' desire for immortality. The entire slope of the Longevity Hill is covered by seven groups of giant buildings, with the Tower of the Fragrant Buddha in the center. The rich verdure of the hill, the rippling water in the lake, the golden glory of the pavilions and halls, combine to engender the feeling in the visitor that he was walking in heaven. The Summer Palace, with its graceful environment. is definitely a gem in the Chinese art of garden construction and the world history of garden construction and horticulture. 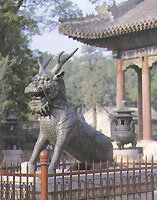 The predecessor of the Summer Palace was a provisional palace of the Jin Dynasty. 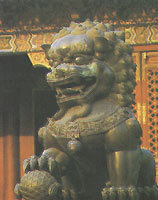 It was built on during the Yuan and Ming dynasties and given different names. In 1750, or the 15th year of the Qianlong Reign of the Qing Dynasty, Emperor Qianlong went on a construction binge and renamed the place Qingqiyuan (Garden of Rippling Waves). In 1860, the Anglo-French allied force burned it to the ground. In 1888, the Empress Dowager Cixi embezzled 300,000 tales of silver of navy fund to rebuild the garden and renamed it Yiheyuan, meaning "Garden of Health and Peace". In 1914, that is, three years after the Revolution of 1911, the Summer Palace was opened to the public for the first time. In 1924 it was officially converted into a public park, but by the time of liberation it tell into disrepair. After liberation, the park underwent repeated large-scale refurbishment to became a museum-type classical garden. The Summer Palace of today is no longer what it was in its early days, but it remains as the most complete classical imperial garden of colossal proportions in existence today. In December 1998, it was listed as a world cultural heritage. In the east is the Eastern Palace Gate Zone, where Qing emperors used to engage in political activities and spend their daily lives. Major structures in this zone include the Hall of Benevolence and Longevity (where officials were summoned for court sessions), residential palaces, theatre and courtyards. The front of the Longevity Hill is clustered with the largest number of structures and looks the most glorious. It is marked by two lines that meet at right angles. The east-west line is none other than the Long Corridor. The south-north line, which begins at the middle of the Long Corridor, is strewn with a group of structures such as the Cloud Dispelling Gateway, the Cloud Dispelling Hall, the Hall of Virtuous Light, and the Tower of the Fragrant Buddha. The Tower of the Fragrant Buddha forms the center of the entire garden, with the structures in its vicinity laid out in a symmetrical fashion. The Rare Mountain and Rear Lake Scenic Zone are found in the northernmost part. Despite the lack of buildings there, the place is heavily wooded. A mountain path winds its way up the hill, and the tranquility of the place is set in striking contrast with the throng of the frontal hill. There is also a group of Tibetan structures and a pagoda with glazed tiles, laid out according to a well-conceived plan, and each is fascinating in a unique way. Water surface comprises three fourths of the entire garden. The frontal lake zone in the south, in particular, turns out to be an extensive expanse of water, with the blue smudge of mountains undulating in the west and pavilions and chambers clustered in the north. Six bridges of different designs are found among willow trees that line both sides of the Western Dyke in the lake. The three isles on the lake are each graced with a group of classical structures. A 17-span bridge, gracefully designed, lies on the lake, which not only provides vital access to the lake, but is an unforgettable scenic spot in itself.